Why is it a Great Gift ? : Be it a birthday or an anniversary, perfumes make a great gift. What better than sending a fragrance that will leave everyone enchanted !! 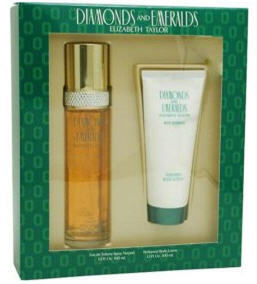 The Diamonds & Emeralds By Elizabeth Taylor is among the best perfumes available in the market today. Send one right away! Diamonds & Emeralds Perfume by Elizabeth Taylor, Launched by the design house of elizabeth taylor in 1993, diamonds & emeralds is classified as a sharp, flowery fragrance. This feminine scent possesses a blend of green floral top notes with white rose, water lily and gardenia, with lower notes of carnation and jasmine. Set includes- Edt Spray 3.3 Ounces & Body Lotion 3.3 Ounces.